Collins Booksellers - Everyday Mathematics for Parents by The University of Chicago School Mathematics Project, 9780226265513. Buy this book online. The Everyday Mathematics (EM) program was developed by the University of Chicago School Mathematics Project (UCSMP) and is now used in more than 185,000 classrooms by almost three million students. Its research-based learning delivers the kinds of results that all school districts aspire to. Yet despite that tremendous success, EMoften leaves parents perplexed. Learning is accomplished not through rote memorization, but by actually engaging in real-life math tasks. The curriculum isn’t linear, but rather spirals back and forth, weaving concepts in and out of lessons that build overall understanding and long-term retention. It’s no wonder that many parents have difficulty navigating this innovative mathematical and pedagogic terrain. Now help is here. 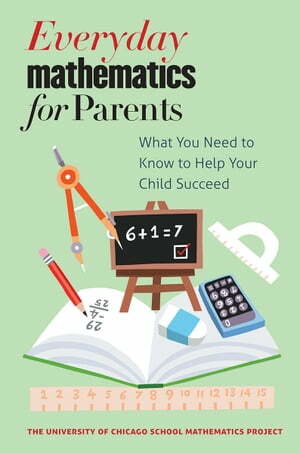 Inspired by UCSMP’s firsthand experiences with parents and teachers, Everyday Mathematics for Parents will equip parents with an understanding of EM and enable them to help their children with homework—the heart of the great parental adventure of ensuring that children become mathematically proficient.